Old Gippstown, Gippsland’s Heritage Park now has a lot more to offer educational visits by students and teachers as well as the general public. 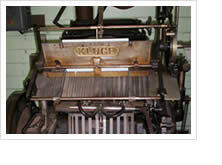 The historical museum, located in the City of Moe, near Melbourne, Australia now has a Kluge Inking Press manufactured by Brandtjen & Kluge, LLC. in St. Paul Minnesota, in 1936. The Press makes up part of a display showing the development of printing from the late 1800’s to the computer age. Other displays include the development of architecture from 1850 to 1930 and transport development of horse drawn vehicles through the mechanical era. Records show that the press is a Kluge 12″ x 18″ Model “N” sheet-fed automatic platen printing press. The press (#12701) and feeder (#122757) serial numbers indicate that this 6 roller press was manufactured and sold to the agent, S. Cooke Proprietary Ltd. of Sydney Australia on January 27, 1936. Today, 71 years later and 88 years after the company was founded, Brandtjen and Kluge, LLC. has grown to manufacture a complete range of foil stamping, embossing, diecutting and folder gluer equipment. More information about Kluge’s current product lines can be found online at www.kluge.biz or by calling the headquarters in St. Croix Falls Wisconsin, USA at (715) 483-3265.